Mediation is a process whereby the parties to a dispute agree to have the assistance of a neutral third party to help facilitate a settlement of their dispute. 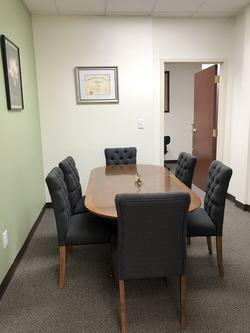 Frequently, the mediator is an attorney or retired judge who has knowledge and experience in the field of law involving the dispute. The mediated settlement conference can be held at an agreed upon location and the parties can choose to have their own legal representation if they so desire. However, legal representation is not necessary. At the conference, the mediator first discusses the rules which everyone must follow and then allows the parties to ask any questions they may have of the process. The plaintiff (the party initiating the lawsuit, if suit has been filed) or his/her attorney usually gives a presentation of what the plaintiff’s issues and position are relative to the dispute. This usually involves a summary of what facts exist to support the plaintiff’s position and what damages the plaintiff is seeking. The defendant, or his/her attorney then presents his/her position including any defenses he/she feels is applicable. Once each side tells their story, the parties are asked to separate and the mediator talks to each party separately. What a party tells the mediator can be kept confidential. The mediator will view the positions of the parties and determine if there is any common ground whereby they can reach a compromise of the case. Any agreement which is reached between the parties must be voluntary. No decision is imposed upon either party. You, as an individual involved in a lawsuit, can at least exercise some control over the outcome of the case by reaching an agreement. It is also a way of bringing the case to a speedier, less costly, conclusion.